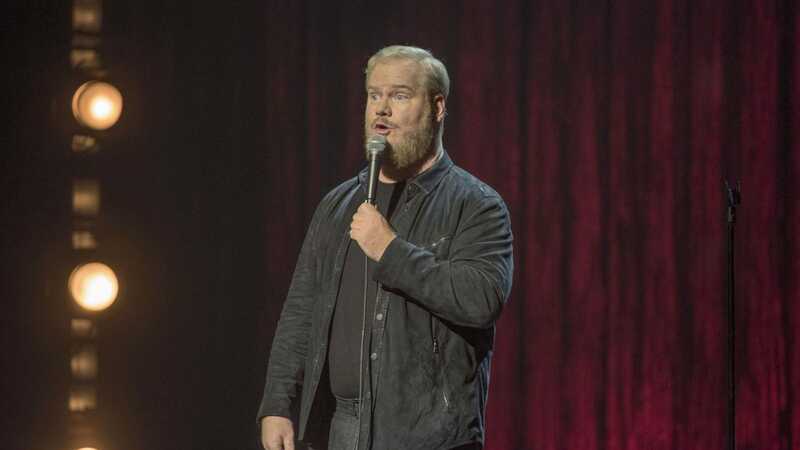 For his latest stand-up comedy special, “Noble Ape,” Jim Gaffigan passed on Netflix to release the special to a variety of on-demand services as part of a distribution deal with the special’s producer, Comedy Dynamics. Gaffigan spoke to Business Insider about the distribution of “Noble Ape” and its intensely personal material, which dealt in part with the surgery his wife underwent last year for a brain tumour. Jim Gaffigan’s latest stand-up special, “Noble Ape,” features some of the strongest material of the comedian’s career. In part, he recounts with moving and dark humour the plight of his wife and cowriter, Jeannie Gaffigan, who last year underwent surgery for a benign brain tumour. But Gaffigan’s unorthodox distribution of “Noble Ape” is nearly as notable as the comedy it contains. With five of his stand-up specials already on Netflix, Gaffigan opted to follow the suggestion of his longtime producer, Comedy Dynamics founder Brian Volk-Weiss, who proposed that Gaffigan release his sixth special simultaneously for purchase and renting on a wide variety of services like Apple TV, Amazon Prime, Spotify, and numerous other on-demand outlets. In July, the expansive release ran through the distribution arm of Volk-Weiss’s company, which also gave the special a limited theatrical run. In a phone interview with Business Insider, Gaffigan discussed the distribution of “Noble Ape” and the process of working on its “cathartic” material with his wife (who directed the special), as well his experiences of touring the world for his act. Jim Gaffigan: Every special that I’ve released, I’ve looked at what was the best opportunity to get that special viewed or listened to by as many people as possible. For my first special, “Beyond the Pale,” Comedy Central was the perfect destination for it. That was a time before streaming, at the peak of Comedy Central, so “Beyond the Pale” and “King Baby” were perfect for that. Comedy Central was on in every dorm room. By the time I got to “Mr. Universe” and “Obsessed,” I looked at what the best opportunity was, and with those, one was released on my website, when that was a thing that people were actively participating in. Then I got to the point with “Cinco” where it was sold directly to Netflix. Now, Netflix also ended up purchasing the rights to my specials to stream on their service. When I had “Noble Ape,” I was like, “All right, I have five specials on Netflix.” I had received offers from the usual suspects, and I was approached by Comedy Dynamics, proposing that the special would be available everywhere people rent or buy. So I wasn’t sure exactly how that was going to work, but they explained that people consume things in a different manner. Some people consume things on-demand. Some people watch it on Amazon Prime. Some people watch it on Apple TV. Some people listen to it on Spotify. So their model – you know, obviously they offered me good money – but their model made it available to everyone. You didn’t just have to have Netflix. And I thought this was appealing, that it’d be available to everyone at the same time. Lynch: Several weeks out from the release now, how are you gauging the success of it? Gaffigan: From what I’m hearing from Comedy Dynamics, it’s doing amazing. The way the distribution is set up, they gave me a lump sum, and after that we split the profits. But I more measure the success of it on people gaining access to it. I mean, this is a very personal special. It’s discussing my wife’s brain tumour and all of that. I would say that it’s been great, but it’s weird, you know, how the landscape changes all the time. From feedback on social media, it’s gangbusters. Do you know what I mean? I’ve never used that term before. Lynch: (laughs) Yeah. You know, I saw it at the Village East theatre here in Manhattan. Given that it was in select theatres, I imagine that wasn’t a huge overall factor in the release. But was it at all important to you to have it in theatres, or how did you think of that aspect of it? Gaffigan: That was something that Comedy Dynamics pursued. It was not something I had an expectation of. With previous specials, when you’re kind of approached with options, that’s one scenario. Comedians have released specials in theatres. But I was thrilled about the theatrical release, even though it was small, just because it was a further example of it being everywhere you watch and rent. Lynch: Seeing it in theatres, you do open with this very cinematic, Buñuel-esque surrealist scene, depicting the horrors of brain surgery but also the dark comedy of that situation. How was it for your wife to direct that opening and the special itself? Gaffigan: You know, it’s interesting. That whole opening was my wife’s idea. It was something that she wanted to do. The timing of us shooting it, because I was working on a couple movies, made it so that it was only available in the theatrical release, and I think it’s been added as an extra feature on iTunes. But that was all Jeannie’s idea. Obviously, my wife and I, we write everything together. She was instrumental in some of the material on her brain tumour, but that opening was all her. It was interesting, and my five-year-old, he was like, “It’s too scary.” The opening’s too scary for him. Lynch: What was your experience generally of incorporating this really personal material with some of the more traditional stuff that you do? How was it working with the mix of that? Gaffigan: Look, as a comedian, it’s incredibly cathartic to process life events into material. It kind of helps organise them, and it pays homage to the feelings or fears you might have been experiencing. But I also think that’s how I process life is through jokes, and same with my wife. My wife came out of a two-hour MRI, and she was like, “Write this down,” like she had ideas from the MRI. It just kind of happens in certain ways. Lynch: In the second half of the special, you sort of take us on a tour describing your touring abroad. You joke about difficulties with social mores in China, Japan, England. I’m wondering, is there any country or area in the world that you’ve found harder to perform in than others? Gaffigan: Well, some of doing stand-up in other countries is – it’s not ideal, but that’s almost what I enjoy about it. First of all, you’re subjected to a completely different set of social norms, and you typically have a language difference. But those obstacles, they provide fodder for material. I did a show in Barcelona, and I only got to spend a day or two in Barcelona, but it prompts you to absorb. And some of it may be initial observation. I’m sorry, I don’t know if I’m even answering your question. Lynch: (laughs) No yeah, it’s all good. Gaffigan: But yeah, I love the international shows because I’m somebody who loves travelling internationally, and I love different cultures. You’re forced to have a completely different point-of-view, and it also gives you insight into your own culture. You know, Paris is a beautiful city, but I think famous writers have written in Paris because they can gain a perspective on America just by being in another country. Lynch: How would you say your years of touring informed this special in particular? Gaffigan: I would say, doing stand-up for as long as I have, you develop a skill set. Any comedian would tell you you should be able to make everything funny, and doing stand-up for that long, whether it be a medical crisis or travelling through another country, those same skills that I use to make food or laziness funny, I can apply those same skills to what it’s like to be an American in another country or what it’s like to have a spouse have this life-threatening medical emergency. Lynch: Going back to the distribution briefly, the path you took for “Noble Ape,” do you see that as a viable option for other comedians, or as something you’ll see people adopt? Gaffigan: What I’ve learned from doing stand-up and releasing six specials now is that the landscape changes relatively dramatically every couple years. There was a time when having a special Comedy Central seemed like the only logical step to take, or releasing a special on Netflix seemed like the only logical step. But the marketplace is ever-changing. By the way, Netflix is great for stand-up. I love Netflix. Netflix has five specials of mine. If I didn’t have five specials on Netflix, I might have taken a different approach. But every couple years, the technology and market changes. When I started stand-up, there was no YouTube. Comedy Central was just like a clumsy cable network that did comedy. I mean, I’m thrilled that people are enjoying this special, and I’m thrilled that Comedy Dynamics views the special as a success. Comedian friends have expressed excitement that there’s an alternative in distribution, but I also know that we live in an age where, in a year, Amazon, or Apple, or who knows, Disney, could get into the comedy business, because comedy specials are relatively inexpensive to produce. What I’ve found with my material, and one of the things that was also appealing, is an audio version being released simultaneously, because a lot of people consume my comedy while driving in a car. Some distribution models, understandably, they want it exclusively to say, HBO, or Showtime, or Netflix. They don’t want the audio version released right away. But in ten or fifteen years, with the audio version of a stand-up special as an album, I think people kind of underestimate the popularity of that, because we’re living in this age where audio streaming services are really rising out of nowhere. Lynch: Moving forward for you, what’s next? I know you’ve also been in a couple films this year, but what’s on deck for you career-wise? Gaffigan: I love acting, and given the right opportunity, I would love to do tons of acting in film. But the thing that’s great about stand-up is you don’t have to wait for the opportunity. You can be writing and working whenever you want. Obviously, living in New York City, it’s helpful to be able to walk over to a club and try out material. I love acting and I love stand-up, but no matter what I do, I’ll always be doing stand-up. Creating specials is something that I really enjoy. “Noble Ape” is available now on on-demand services like Apple TV, Amazon, iTunes, and more.